From 2000 to '06, Bryan Cranston was best known for playing Hal, the bumbling father of a teen genius (played by Frankie Muniz) on the Fox sitcom Malcolm in the Middle. 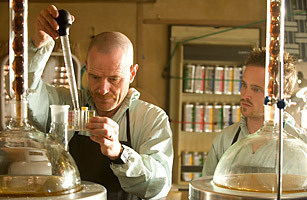 Starting in 2008, Cranston took a much darker turn, starring as Walter White, a cancer-stricken chemistry teacher who becomes a crystal-meth manufacturer, on AMC's Breaking Bad. The actor is virtually unrecognizable from his former role since the shift gave him a whole new look, including a goatee, glasses and a shaved head. Plus, his AMC character's hijinks often result in a body count, not a happy ending. But Cranston's present role seems to be suiting him just fine: he has snagged three consecutive acting Emmys for playing Walter.